long term protective action of resveratrol on human skin? Resveratrol is a powerful antioxidant that is produced by some plants to protect against environmental stresses. It is more commonly known, however, as the active ingredient in red wine that protects against heart disease. Resveratrol very likely has more health benefits than protecing against heart disease however.According to Australian researcher Lindsay Brown, the author an upcoming Resveratrol study, "The breadth of benefits [of resveratrol] is remarkable – cancer prevention, protection of the heart and brain from damage, reducing age-related diseases such as inflammation, reversing diabetes and obesity, and many more...It has long been a question as to how such a simple compound could have these effects but now the puzzle is becoming clearer with the discovery of the pathways, especially the sirtuins, a family of enzymes that regulate the production of cellular components by the nucleus." Further, "...resveratrol turns on the cell's own survival pathways, preventing damage to individual cells," and Resveratrol " remov[es] very reactive oxidants in the body and improv[es] blood supply to cells." Moreover, "...low-dose resveratrol produces cellular protection and reduces damage, while high-dose resveratrol prevents cancers." Question is there a long term protective action of resveratrol on human skin? Resveratrol derived from plants with claimed protective action on various dysfunctions associated with getting older. The conclusions based on findings suggest that resveratrol, may be a useful prevention in the prevention of skin disorders that we associate with aging. Sesame Seed oil Lecithin Mixed Tocopherols Suggested Use: As a dietary supplement. 1 capsule one or two times daily, with or without food. Warning: Do not take if you are nursing pregnant or intending to become pregnant. Not recomended for children. Please consult your healthcare practitiioner before taking any dietary supplement. Please see our 'Pet Care' section. Just as in humans, supplements may be the best tool for maintaining health and preventing disease for your pets and horses. Research has proven that resveratrol is the first compound to consistently prolong the life of several different animal groups. 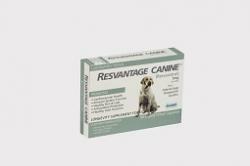 RESVANTAGE® companion pet and equine supplements contain non grape sourced resveratrol blended together with a unique combination of nutrients that work synergistically to help them reach full potential and diminish the many symptoms associated with aging.